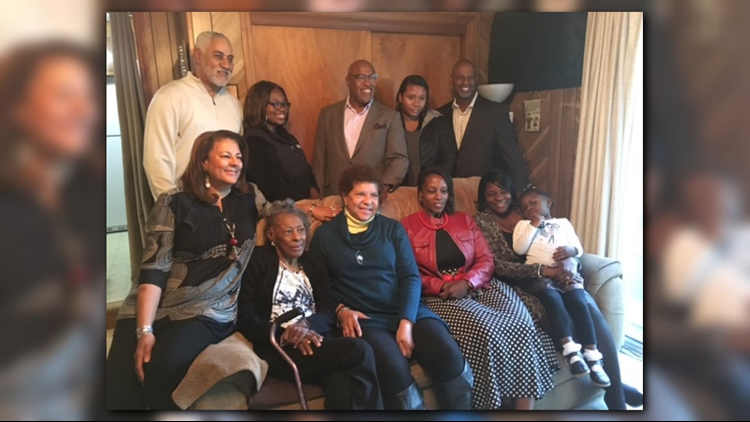 Four-hundred years ago, the first Africans arrived on the shores of Hampton Roads after being torn away from their homeland. HAMPTON, Va. — A deeply powerful and often overlooked American story began in 1619. Four-hundred years later, the nation turns its attention to Hampton, Virginia in commemoration of the first Africans to arrive in English North America. About 20 of the native Angolans, ripped from their homeland, landed at Fort Monroe in Hampton, known then as Point Comfort. "These were folks from the Ndongo Kingdom... a very powerful kingdom. Those were the people who were attacked. Those were the people who were enslaved. Those were the people who were eventually brought to the Virginia Colony, " said Dr. Cassandra Newby-Alexander, the Dean of the College of Liberal Arts at Norfolk State University. Leading up to their capture, the Africans in the Ndongo Kingdom in West Africa were embroiled in conflict. Portuguese settlers were trying to expand their territory. 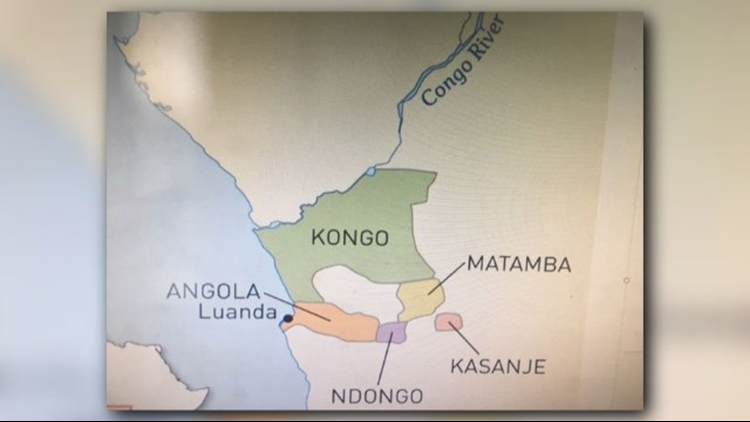 "Part of the reason why they came there was because of the large presence of gold and the Ndongo, in particular, mined a lot of gold," said Newby-Alexander. That led to war between Ndongo and the Portuguese. Many African war prisoners were shipped from Angola to Spanish and Portuguese colonies in a slave trade that began in the 15th century. The Africans were marched from their villages to the Port of Luanda and placed on slave ships. One of the ships that carried some 350 Africans was the San Juan Bautista. It was raided by two British pirate ships, the White Lion and the Treasurer, near Vera Cruz, Mexico. Expecting to find gold, the British were surprised by the human cargo. About 60 Africans were split between the two ships and headed for Virginia. In late August 1619, as recorded by English settler John Rolfe, "20 and odd Negroes" arrived at Point Comfort on the White Lion. The Treasurer arrived with an unknown number of Africans days later. Inside the Hampton History Museum's 1619 exhibit is a replica of the White Lion. 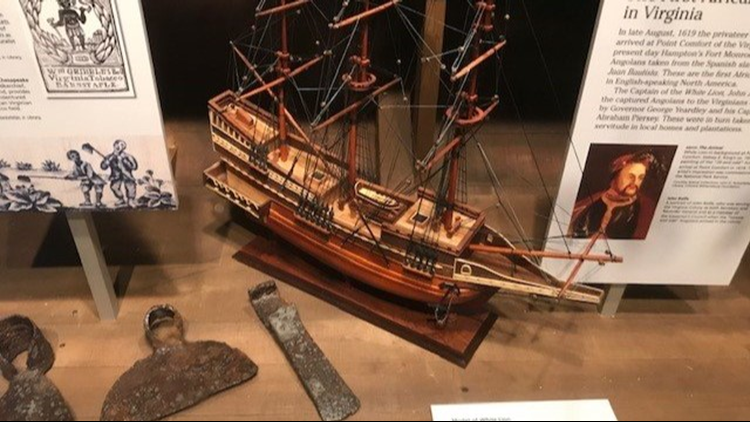 "Word spread to Jamestown that there was this new arrival and the Governor should come and have a look-see," said museum curator Allen Hoilman. A replica of the White Lion sits in Hampton History Museum. The Africans worked alongside white indentured servants and were treated like slaves. "They may have been treated when they were put to work similarly to indentured servants. They may have been cared for similarly but they never had a contract. There was never an end to their servitude." Hoilman explained. The Africans found themselves in a strange new land, thousands of miles from home, and scattered throughout homes and plantations along the James River. They would be the first of hundreds of thousands of enslaved Africans in English North America. Listed on the Virginia Colony's 1623-24 muster are two names, Anthony and Isabella. They are described as Negors, believed to have been captives on the White Lion that arrived in Point Comfort in 1619. They resided with Captain William Tucker in what was Elizabeth City, present day Hampton. By 1625, the muster shows an "Antoney and Isabell" had a child named William who had been baptized. He is believed to the first African born in English North America. Today, much of the Tucker family still resides in the Hampton area, where tucked away in the historic Aberdeen Gardens neighborhood is the Tucker Family Cemetery. "Now there's a family actually attached to the story, so you can actually see it and you can hear from us, hear the actual narrative that's coming from us, the family. So yes, we do exist. It's not just in a book," said Veranndall Tucker, a Norfolk wardrobe consultant. Dozens of graves dot two acres of property nestled in between homes. "We have uncles, aunts, cousins, and the latest one grandfather -- grandfather's father," said Veranndall's brother Vincent while strolling through the cemetery. He is the president of the William Tucker 1624 Society. Tall trees surround the grounds as if to stand guard over the historical treasure. More than 100 graves are unmarked and the Tuckers believe some might contain the first Africans, including their ancestors. They hope ground-penetrating radar can lead them to more answers. Orange flags mark the graves with contents that have yet to be identified. "If they called it an old colored people's graveyard in 1896, it was already in existence," Vincent said. About eight miles from the cemetery is Bluebird Gap Farm in Hampton. The land is believed to have once belonged to Captain Tucker, after the original landowners, the Kecoughtan Indians, were slaughtered and run off the land. "My grandfather used to point to that all the time and say, 'You know, we used to live there. That's where -- you know, our property.' He actually considered it his property," said Carolita Jones, a Tucker family member. The Tuckers said that for now, they know little about Anthony, Isabella, and William but hope future research will produce more details. Family member Walter Jones said their pride resides in the discoveries so far. "Just proud to be part of the family and knowing what our forefathers and mothers went through, to survive what they did," Walter explained. The archaeological dig with the Jamestown Rediscovery Foundation is giving voice to the voiceless. The hope is to unearth enough artifacts to help tell the story of an African woman listed in the 1625 Virginia Colony muster as Angelo (Angela). The dig at the "Angela" site is in its second year. She arrived in 1619 on the British ship Treasurer and served on the property owned by a wealthy merchant, Captain William Pierce at Jamestown. "We know Angela was here, but other than that, we don't know how she worked, how she changed the foodways of the Pierce family, what the first Africans' impact was in America and that's critical," said the director of archaeology David Givens. Meticulously, one archaeologist shovels on site and two others sift through every grain of dirt, searching for the next historical find. Layer-by-layer, they've reached the ground where Angela once stood. "I'm certain we found something of Angela's, but the question is what will that be for a woman who was brought over from Angola with nothing... no possessions. So the goal is to find out what impact she had on the Pierce household." The team has found a number of ceramic pieces more than likely brought over by English settlers. They've discovered old graves, pigs' teeth, and tools. "We're finding Native American material here because William Pierce and John Rolfe were teaching the Chickahominy Indians how to use firearms and they were here on this site, so Angela's world included Virginia Indians." The site is open to the public every day of the year, except Thanksgiving, Christmas and New Year's Day. Archaeologists with the Jamestown Rediscovery Project examine a piece of ceramic unearthed from the "Angela" site. You could see the excitement on the faces of Hampton's Cooper Elementary fifth graders at the possibility of discovering something new. On a visit to the Hampton History Museum, they saw an exhibit all about the first Africans who arrived in 1619. One gaze at the replica of the White Lion ship that brought the Africans to Virginia and student, Rayghen Judd understood the lessons that can be learned. "Very important so we know what happened in our past, so that we don't make the same mistakes." 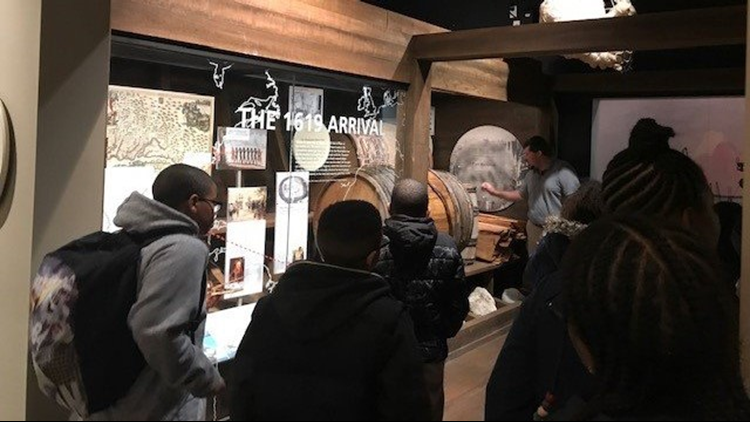 Fifth graders from Cooper Elem in Hampton learn about the 1619 Arrival exhibit at the Hampton History Museum. Dominating the exhibit: a hogshead of tobacco that would have weighed a thousand pounds densely packed. It's symbolic of the economic benefits reaped by the English of forced African labor. Tobacco cultivation is one of many skills the Africans brought with them. "They had already learned the ins and outs of tobacco production decades before," said Museum Curator Allen Hoilman. Part of what the kids learned through their visit is the Africans' durable imprint on what America is today. "Cuisine. We see that. My students got surprised when I told them that Africans introduced rice in this country. They thought it was from China. No, it's not from China," said Dr. Patrick Mbajekwe, an associate history professor at Norfolk State University. The 2019 Hampton Commemorative Commission hopes yearlong scheduled events in Virginia will help cultivate a better understanding of who the first Africans were and their contributions. Dr. Colita Fairfax, the commission co-chair, expects the year will provide several teachable moments. "I think the cunning genius of African people, the different philosophies with regards to ethics and morality," she said. "We just don't consider that those are African principles and precepts but they really are. And those are just some examples of how Africans have contributed immensely to what we now call America." 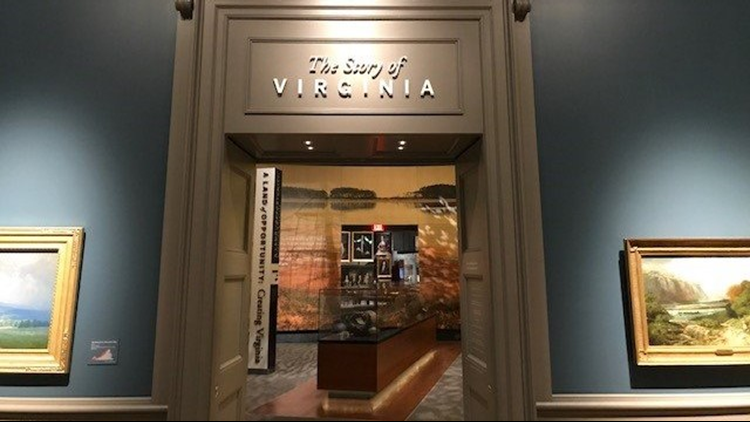 The Virginia Museum of History and Culture will feature an exhibit beginning June 19th called, "Determined:The 400-Year Struggle for Black Equality."